Any world where you want a healthy population of roaches in your kitchen and bathroom is potentially interesting in the hands of a good writer. 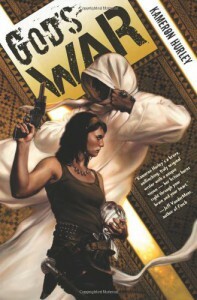 Fortunately, Kameron Hurley is pretty good, and Umayma is one of the more interesting future histories to appear in the last few years – insect-based technology, an Islam-influenced culture, a centuries-old religious war, an organization of murderous female assassins, boxing, magicians and shapeshifters. Such a world, however, would be a sterile read no matter how inventive the details if there weren’t any interesting characters populating it, and here again Hurley comes through. Both of the protagonists, Nyx, erstwhile bel dame (see “murderous female assassins” above), and Rhys, fugitive Chenjan magician (though not a very good one), are believably complex characters motivated by misplaced senses of inadequacy and a need for atonement that translates into making them an extraordinarily effective team. Nyx can’t forgive herself for failing to save her brothers and for a mistake that killed her squad during her time at the front; Rhys can’t forgive himself for fleeing from service at the front. Hurley offers enough detail to make Umayma seem real without overwhelming you with boring exposition. For example, Umayman xenophobia is clearly expressed by the fact that the non-Umayman humans are always referred to as “the aliens.” Or there’s the factoid that most visitors to the system were attacked and destroyed (which very quickly isolated the planet from the rest of the galaxy). I was also intrigued by Hurley’s almost coy allusions to the permutations of Islam that have shaped the dominant nations of the planet (Nasheen – a female-dominated polity – and Chenja – still ruled by male mullahs). Rhys carries a copy of the Kitab, not a Quran. “Kitab” is Arabic for “book”; “Bible” derives from the Latin for “book.” So one wonders what the contents of Rhys’s scripture is. And there are allusions to a more Christianity-oriented religious war being fought amongst “the aliens,” who play a prominent part in the plot. I would strongly recommend this book. The violence can be over the top but I think that’s another one of its strengths in that it depicts the deteriorization of civil society in the face of endemic war (a depiction further elaborated on in the sequel, Infidel, where the “diplomatic” overtures of the bel dames are contrasted with the cultured responses of the Tirhani). I would say that I’m looking forward to the next book in the series but as I’ve already read it, that would be untrue. However, I am looking forward to the third book, Rapture, coming in November. And I would be remiss if I didn’t also recommend Ceridwen’s review, which does a far better job than I of conveying the uniqueness of this book.